Powdered turmeric works, but nothing beats the robust aroma and flamboyant color of the fresh root. Slice it open, and you will see. This is what gives many Asian curries their distinction. The above photo was taken at a Bangkok market, but fresh turmeric root also is available at Asian markets and food co-ops throughout the West. Earlier this year, we heard that a weekly dose of curry could save us from dementia. Now, the BBC reports on lab tests showing curcumin to be effective in killing esophageal cancer cells. The disease kills more than 14,000 people each year in the United States alone. So go ahead, paint your plate yellow. It’s good for the eyes—and the rest of you! Hey Karen, thanks for the tip on turmeric’s benefits. 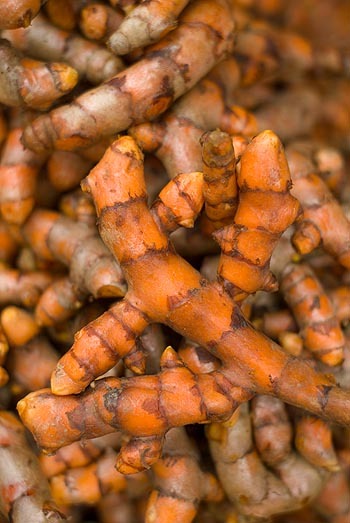 In Vietnam, we’ve long used fresh turmeric on blemishes to help them fade faster. I don’t know if it actually works, though! Nikkipolani, I know many an Asian grandmother who swears by turmeric’s ability to make the skin healthy, happy and beautiful. Grandmotherly wisdom, for what it’s worth. Turmeric is found in a lot of soaps and facial masks and I must admit, it makes my skin feel smooth. Karen, thanks. You can, of course, hire someone to design your blog. But if you’re hoping to save money, there are numerous websites offering free and relatively cheap blog templates. For example, this blog uses WordPress. If you Google “WordPress blog templates” or “free blog templates” you’ll come up with more than enough options to make your head roll. Good luck! Hi Karen! Fresh turmeric is sooo appealing. I really like eating thin slices of it raw, although marinating the slices in lemon juice is one of my favorite uses for turmeric (and then put it on yogurt, or use as a ‘pickle’ side dish). Funny that you mentioned how it made you skin feel, it turns my fingers sticky and unpleasantly orange! Not to mention the paring knife, peeler and cutting board (I now even have a dedicated one that is permanently stained…) get a resinous coating that is tough to clean. An alternative is white turmeric- a little harder to find, but Indian markets should have them. A bit lighter in flavor, not fiery orange, but no staining! My most unusual use for fresh turmeric was turmeric sorbet, but I added too much…I think it should be quite refreshing- I’ll have to try again. Conveniently it seems to freeze well too (great for adding to smoothies). fillsfotos, thanks for the ideas. I’ve never tried turmeric marinated in lemon as an addition to yogurt! Oh, and of course, everything gets stained (though the soaps and facial masks I buy in Thailand do not stain the skin). I LOVE white turmeric. There used to be a great little restaurant in Chiang Mai that served fresh white turmeric slices with nam phrik kapi. Yum. It seems like the white turmeric would get upstaged by the nam prik kapi??! I’m guessing reasonable sized slices; in any case it does sound good. According to Wikipedia, I noticed that a big ethnic group near Chiang Mai is the ‘Karen’- did you hang out with them or, I don’t know, ask to be their leader for a day?